Good sleep is critical to fleet driver safety. Drowsiness and fatigue are significant causes of accidents. The National Highway Traffic Safety Administration says fatigue is responsible for 100,000 police-reported collisions more than 1,000 fatalities a year. 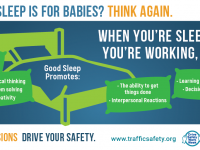 Today's Drive Safely to Work Week tweet explains all the ways that good sleep makes for safe driving. Think sleep is for babies? Think again. When you’re sleeping, you’re working, too!